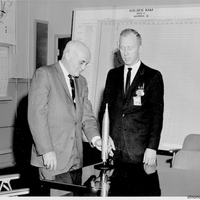 Dr. Cal Fowler (1929-2013), photographed on the right, presenting Secretary of the Air Force Eugene M. Zuckert (1911-2000) with a model of the Atlas E missile in honor of the completion and activation of the Warren III missile site. Warren III was a semi-hardened (the missile was some what protected by a concrete bunker) so-called "coffin site," where the missile was stored horizontal in a shallow bunker but erected for launch. The Atlas E Intercontinental Ballistic Missile (ICBM) was significant because it had inertial guidance that allowed for launchers to be spread over larger areas. "EUGENE M. ZUCKERT." U.S. Air Force. http://www.af.mil/AboutUs/Biographies/Display/tabid/225/Article/105407/eugene-m-zuckert.aspx. “Dr. 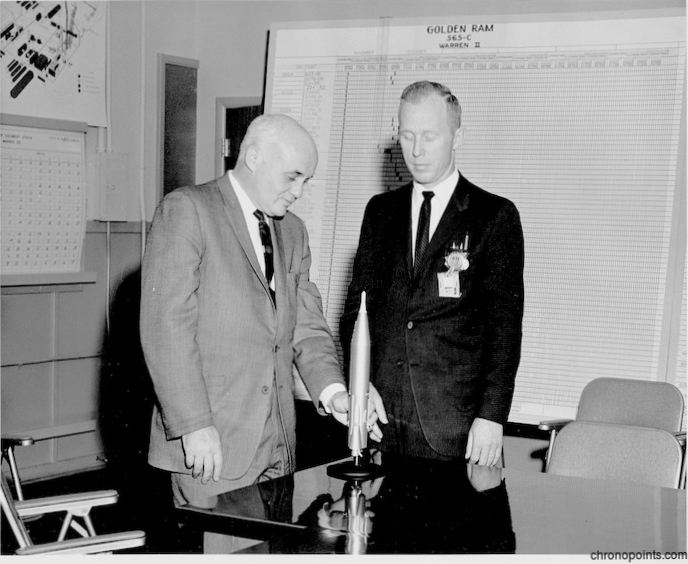 Cal Fowler Presenting the Atlas E Model to Eugene Martin Zuckert.” RICHES of Central Florida accessed April 23, 2019, https://richesmi.cah.ucf.edu/omeka/items/show/6405.